Blackman Charter Township is located in the South central part of the Lower Peninsula of Michigan. It borders the North side of the City of Jackson in Jackson County. The township is 32-square miles and has a population of 24,000. It is home to numerous large industrial and manufacturing companies and contains the hotel, restaurant and retail districts of the county. 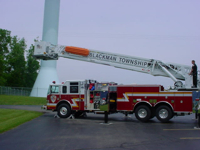 The Blackman-Leoni Township Department of Public Safety provides police, fire and emergency medical services to the residents of Blackman Township and Leoni Township. Blackman and Leoni Townships occupy 84-square miles and are home to 40,000 residents. Both Townships border each other, as well as the City of Jackson. The Blackman-Leoni Department of Public Safety is a fully-consolidated public safety agency; all officers are cross-trained as police officers, fire fighters and to at least the medical first responder level. The department is led by Director Mike Jester. The department currently has 34 sworn officers and handles approximately 22,000 calls for service per year.